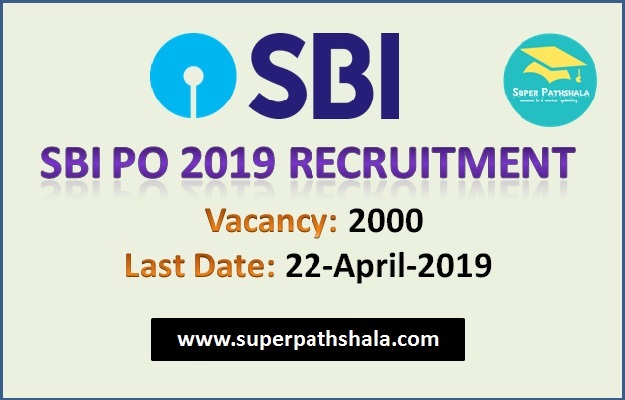 The SBI PO 2019 Notification has been released by SBI on 1st April 2019 for the 2000 Probationary Officers (PO) post. SBI PO 2019 Prelims exam is scheduled on 8th, 9th, 15th & 16th June 2019. 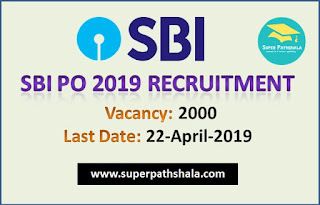 Applications are invited from eligible Indian Citizens for appointment as Probationary Officers (POs) in State Bank of India. Candidates selected are liable to be posted anywhere in India. Eligible candidates, who aspire to join State Bank of India as a Probationary Officer, are required to register on-line for the Recruitment Process. The recruitment process will be held in three phases i.e. Candidates who are shortlisted after Preliminary Examination will have to appear for Main Examination. Candidates who are shortlisted after the Main Examination will be subsequently called for Group Exercises & Interview. Prospective candidates can apply after carefully reading the advertisement regarding the process of examinations/ interview, eligibility criteria, online registration processes, payment of prescribed application fee/ intimation charges, pattern of examinations, issuance of call letters etc. and ensure that they fulfill the stipulated criteria and follow the prescribed processes. "Multiple Disabilties" (multiple disabilities amongst LD, VI, HI, SLD & MI). Disclaimer: "EWS vacancies are tentative and subject to further directives of Government of India and outcome of any litigation. The appointment is provisional and is subject to the Income & Asset certificate being verified through the proper channels."